Are you looking to update your patio or porch with unique outdoor furniture? You have come to the right place. We have a wide variety of elegant and practical outdoor furniture that can completely transform your patio. From dining tables to chaise lounges, our showroom is full of the most amazing outdoor furniture, consigned from some of the most sought after homes in the Coachella Valley. At Encore Consign + Design, we have been a relied upon source for unique, quality home furnishings in the Coachella Valley. Our staff is prepared to assist you in the sale of your outdoor furniture. When you choose to consign with us, you have the opportunity to leverage our extensive marketing platform to avoid the risks of direct selling and ensure that you find the right buyer for your furniture. To learn more about our consignment process, please click on the button below. 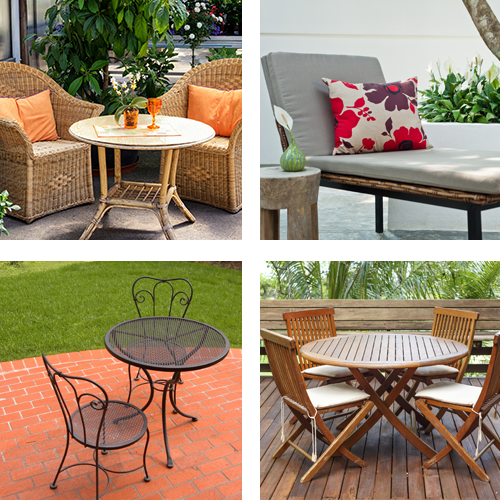 Decorating your patio or porch with the right furniture can be an overwhelming process. There are many different types and styles of outdoor furniture that can leave you with more stress than you might have imagined. When you shop at Encore, we can help you eliminate this stress with our collection of elegant, yet durable outdoor furniture. We hand-select and inspect every item in our consignment furniture store to ensure the utmost quality and style. Our design specialists are eager to assist you in finding the right furniture for your outdoor space and can help you navigate through our expansive showroom with ease. To start shopping our beautiful outdoor furnishings, backed with a higher level of service, we invite and encourage you to visit us today.